Since surfaces coated with Teflon® are both oleophobic and hydrophobic, they are not readily wetted. Cleanup is easier and more thorough – in many cases, surfaces are self-cleaning. 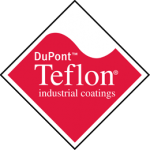 Teflon® industrial coatings can operate continuously at temperatures up to 260°C/500°F and can be used for intermittent service up to 316°C/600°F with adequate ventilation. Over a wide range of frequencies, Teflon® has high dielectric strength, low dissipation factor, and very high surface resistivity. By special techniques, it can even be made electro conductive enough to be used as an anti-static coating. Many Teflon® industrial coatings withstand severe temperature extremes without loss of physical properties. Teflon® industrial coatings may used at temperatures as low as -270°C/-454°F. Teflon® is normally unaffected by chemical environments. The only chemicals known to affect all Teflon® industrial coatings are molten alkali metals and highly reactive fluorinating agents. · The quality of the fabric will increase, because the nap does not stick to the drying cylinder. Drying time will reduce. · Teflon® will provide homogeneous sizing, because sizing material does not get dirty on the sizing cylinder. · Teflon® will prevent wrinkledness of fabric, because it provides very smooth surface.